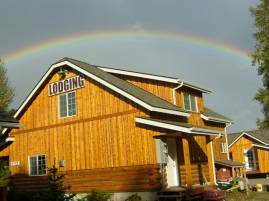 Make Denali Fireside Cabins & Suites your base camp to explore Mt. McKinley, Denali State Park and Denali National Park, the beautiful Susitna Valley and the Southside of Denali. 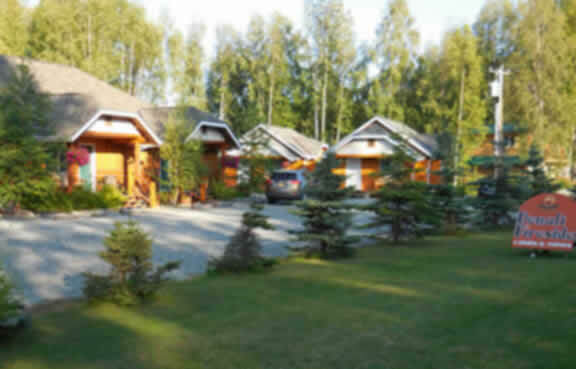 Denali Fireside's lodging accommodations in picturesque Talkeetna, Alaska are located just a short walk from all of the town's many attractions including Mt. McKinley flightseeing, fishing expeditions, riverboat and rafting tours, ATV tours, summer and winter dog sled rides, the Alaska Railroad depot, the Talkeetna airport, museums, restaurants, pubs and gift shops. Our Talkeetna lodging features hotel-quality amenities (but not pricey hotel rates) that also includes quaint gas fireplaces, rustic log construction, custom log furniture and distinctive Alaskana decor. We also have a similar suite with the same amenities featuring one queen bed and a queen sofa bed with coffee table and end tables in a nice sitting area near the TV and fireplace. Enjoy a hot cup of morning coffee outside on the rustic log glider or if it is chilly, you can cozy up to the fireplace with your favorite beverage. Weather permitting, we have great views of Mt. McKinley and we are only a short walk to Main Street. Our deluxe cabins have all of the same "hotel quality" amenities and appointments that our suites have but are free standing units designed for your individual comfort and privacy. The rustic log exterior and decorative log furniture give them a distinctive "Alaska" feel and a homey atmosphere. Weather permitting, we have great views of Mt. McKinley. Main Street is a short walk. Snuggle up on the sofa next to the warmth of the cozy gas fireplace; a fireplace gives a romantic touch for the young at heart. For that morning cup of coffee, try the glider on the large covered deck, also a great way to relax "out of doors" after a day of fun activities! $189 per night based on double occupancy. $109 - $159 during the off-season. $209 - $229/night double occupancy. $129 - $179 during the off-season. We offer a 10% Discount for Active Military. All prices plus 5% bed tax. A deposit equivalent to one night's lodging or 50% of the total reservation, whichever is greater, is required at time of booking. Balance is due 14 days prior to arrival. Cancellations: 85% of the reservation amount will be refunded if notice of cancellation is given at least 14 days prior to arrival date. * Fields are required. Please be sure you filled in your first and last name and your email address. History was made in 1959 when Alaska became a State. 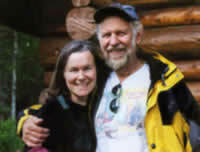 In that same year, Don Devore's family joined with a hardy group of like-minded Michigan adventurers that trekked over the rugged and historic Alcan (Alaska-Canada Highway) in a "motorized wagon train" to homestead land in Alaska. The Devore family (mom, dad and 5 kids) staked out land five miles north of Talkeetna at Mile Post 232 on the Alaska Railroad. The group became known as the Alaska 59ers and were considered modern-day Alaska pioneers setting out to tame the Alaska wilderness. 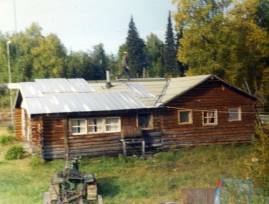 In 1959, Talkeetna was an isolated fishing village that catered to local Alaska homesteaders gold miners, trappers and railroad line crews. In those years, the amenities of the village were few. There was no water and sewer, no paved streets or street lights. The electric power (which was limited and sporadic) was provided by a diesel generator operated by Myron Stevens. Homesteading was tedious hard work and the long harsh winters were grueling. The sun appeared only briefly in the dead of winter and the temperatures often dropped below -30 F. Homesteading was tough but rewarding. Families and friends grew close, helping each other in hard times or sharing what they had. Summers were dedicated to clearing the land, putting up firewood and preserves, planting the garden and canning salmon to carry us through the long winter months. Moose meat and potatoes were dietary staples. Though tough, those years were some of the best years of my life. As a family, we learned self-reliance and survival on the barest of necessities. Our nearest neighbor was four miles down the tracks toward Talkeetna; our mail was thrown from a speeding train. The old homestead cabin is in various stages of disrepair and collapse and is getting quite overgrown. However, it can still be seen from the railroad or by a short five mile hike up the tracks from Talkeetna. It is one of the only remaining 59er cabins left in Alaska and is one of the most photographed sites along the railroad. 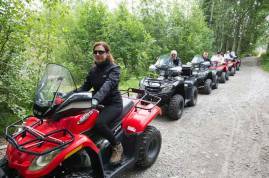 For a tour of the old homestead and an exciting ATV ride, contact Dennis Devore at Alaska Wilderness Adventure. 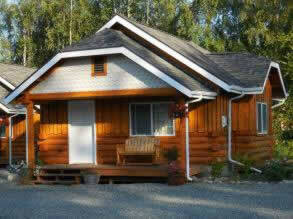 See Talkeetna River Lodging for a private getaway. Great for some quiet time in the woods or perfect for a honeymoon. 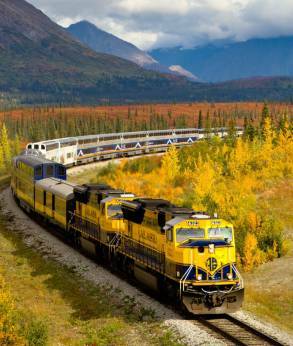 Alaska has only one railroad, the historic Alaska Railroad which runs from the coastal city of Seward in the south to the interior city of Fairbanks in the north. On its way north, the Alaska Railroad passes through the village of Talkeetna, one of Alaska's favorite tourist, sport fishing destinations and places to stay. Construction of the Alaska Railroad began in 1902 by a private company (Alaska Central) which laid tracks from Seward 51 miles north to Spencer. The railroad survived several years of financial difficulties and changed ownership, and by 1914 was purchased by the U.S. government which began extending the line northward. In 1915, President Woodrow Wilson selected Talkeetna as the headquarters for the Alaska Railroad Engineering Commission to oversee construction of the railroad north to Fairbanks. On July 15th, 1923 President Warren G. Harding drove the final "golden spike" at Nenana, Alaska, completing the approximate 470 miles of line from Seward to Fairbanks. Talkeetna played a historic role in facilitating construction of the Alaska Railroad and continues to be one of the railroad's main tourist destinations (along with the Denali National Park). The Alaska Railroad is also the last "flag stop" railroad in the U.S., where travelers can flag the train down to access or egress remote areas along the tracks. This is especially true of the vast wilderness areas north of Talkeetna where there are literally no roads. Many of the homesteaders, miners, trappers and settlers north of Talkeetna depend on the Alaska Railroad flag stop as a lifeline to civilization. 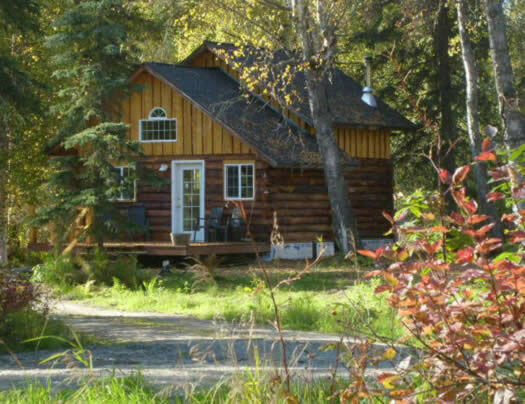 Denali Fireside Cabins & Suites is located in Talkeetna Alaska, just a few minutes walk from the Alaska Railroad depot. Complimentary pickup from the train station is available. All of Talkeetna's amenities are within a few minutes walking distance from the Denali Fireside lodging.